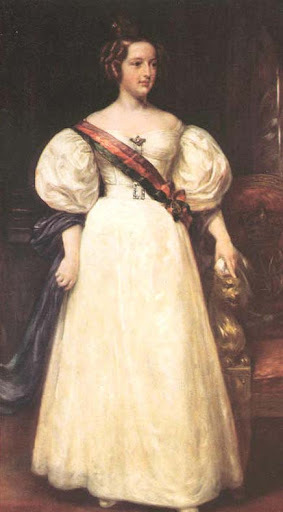 Reign: 1826 - 1853 her uncle Miguel was proclaimed King on 11 Augustus 1828, and a bloody civil war started; Queen Maria's armies, led by her father Emperor Pedro I of Brazil were victorious and in 1834 Miguel agreed to permanent exile and Maria became again Queen de facto. Parents Prince Augusto: Eugene de Beauharnais, Viceroy of Italy, Prince Imperial of France and later Duke of Leuchtenberg & Frst von Eichstädt and Princess Augusta of Bavaria. 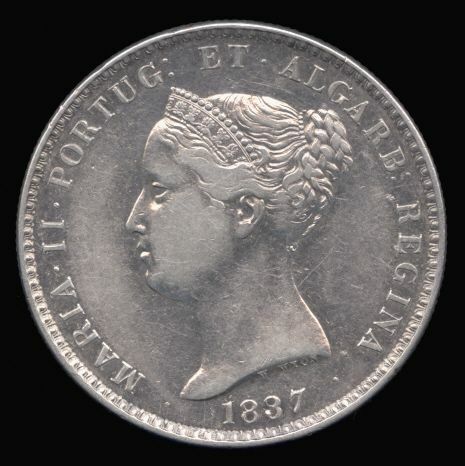 Maria II da Glória (Rio de Janeiro, April 4, 1819 – November 15, 1853 in Lisbon), named Maria da Glória Joana Carlota Leopoldina da Cruz Francisca Xavier de Paula Isidora Micaela Gabriela Rafaela Gonzaga de Áustria e Bragança was Queen of Portugal from 1826 to 1853. The daughter of the future King Pedro IV (Emperor of Brazil as Pedro I) and his first wife, Archduchess Maria Leopoldine Josepha Caroline, herself a daughter of Emperor Franz I of Austria, she was the second Queen regnant of Portugal and Algarves and the 29th (or 30th according to some historians) Portuguese monarch. In March 1826, King João VI died, creating a succession crisis in Portugal. The king had a male heir, Dom Pedro, but Pedro had proclaimed the independence of Brazil in 1822 and he was now Emperor Pedro I of that country. The late king also had a younger son, Miguel, but he was exiled in Austria after leading a number of revolutions against his father and his liberal regime. The king had nominated his favorite daughter, Isabel Maria, as regent until "the legitimate heir returned to the Kingdom". But he didn't specify who was the legitimate heir. Pedro, the liberal Emperor of Brazil, or Miguel, the absolutist exiled prince? Most people considered that Pedro was the legitimate heir, but nobody wanted him to unite Portugal and Brazil's thrones again. The European country had been under Brazilian rule when both were part of The United Kingdom of Portugal, Brazil and Algarve, established by the King João VI during his stay in Rio de Janeiro from 1808 until 1820. Aware that his brother's supporters were ready to bring Miguel back and put him in the throne, Pedro decided for a more consensual option: he abdicated the throne to his eldest daughter, Maria da Gloria (who was only 7 years old), and she should marry her uncle Miguel, who should accept the Liberal Constitution and act as a regent until his niece was an adult. Auguste (Charles Eugène Napoléon) de Beauharnais, 2nd Duke of Leuchtenberg (9 December 1810 - 28 March 1835) was the first Prince consort of Maria II of Portugal. Born in Milan, Lombardy, he was the eldest son of Eugène de Beauharnais and Princess Augusta Amalia Ludovika Georgia of Bavaria. His maternal grandparents were Maximilian I Joseph of Bavaria and his first wife Marie Wilhelmine Auguste Landgravine of Hesse-Darmstadt. His maternal grandmother Marie Wilhelmine Auguste was a daughter of Georg Wilhelm of Hesse-Darmstadt, younger son of Louis VIII, Landgrave of Hesse-Darmstadt. Ferdinand of Saxe-Coburg-Gotha (October 29, 1816 - December 15, 1885), named Prince Ferdinand Augustus Francis Anthony of Saxe-Coburg-Gotha-Koháry, was king consort to Maria II of Portugal from their marriage in 1836 to her death in 1853. In keeping with Portuguese law, only after the birth of his son in 1837 was he styled Ferdinand II of Portugal. He was regent for his son Pedro V from 1853 to 1855. He was born a German prince, of the House of Saxe-Coburg-Gotha. Ferdinand was the son of Ferdinand of Saxe-Coburg, Prince of Kohary and his wife, Princess Maria Antonia Koháry, heiress of Čabrad and Sitno, both in modern Slovakia, a Catholic noblewoman who inherited her family's position as Magnate of Hungary. (Because of the inheritance of Kohary, this branch of the previously fully Protestant Coburg family became Roman Catholics, and good marriage material to Roman Catholic royalties). Prince Ferdinand grew up in several places: the family's lands in modern day Slovakia, the Austrian court, and Germany. He was a nephew of Leopold I of Belgium, and a first cousin to his children Leopold II of Belgium and Empress Carlota of Mexico, as well as Queen Victoria of the United Kingdom and her husband Prince Albert. D. Fernando II was one of the most interesting kings IMO... even if he was more of an interesting man, than an interesting king, actually. He was an intelligent and sensible man, a science and artistically orientated mind, who was a strongest influence over his descendants (D. Pedro V, D. Luís and D. Carlos). He mastered the Portuguese language in a remarkable way, specially for a foreigner and was specially interested in the particularities of the language spoken in different regions of the country, he had a keen interest in Portuguese folklore and he was a passionate lover of popular narratives and poetry. Moreover, he was an art collector and a patron of several artists, whose studies abroad were subsidised by him. Webshots-Grand Opening Special: Enter code SAVE25 at checkout and save 25% on your order! An interesting point about the Palace of Pena was that D. Fernando considered it his own private property and when he died he left it to his second wife Countess Edla, after a few public protests, it was bought from her after negotiations, by King Pedro. A visit there is always worthwhile, although I must admit that personally I prefer the Sintra Palace in the middle of the town. The king's will favored the interests of his second wife (the Countess of Edla) and because of it, his memory was greatly criticised - after all, D. Fernando was the king, when he bought the property. But the truth is that even the objects that decorate the palace were purchased by him, at his expenses, from the ruined monasteries and noble houses that were selling their assets to pay off the debts. If it wasn't him, everything would have been lost... anyway, we must be glad now, that the palace is part of the National Patrimony and not in the hands of some private family. D.Fernando did NOT buy the palace of Pena and rebuilt it. It used to be an ancient convent that he bought and adapted to a royal residence . You still can see the cloister and some parts of the palace that were depicted in old pictures such as the pyramidesque tower that opens to the patio. D.Fernando consecrated much of his time and revenues to the palace and to the lovely park that surrounds it, planting exotic specimens of flora that adapted to Sintra's micro-clima. 2nd correction. D.Fernando died in 1885, more than 20 years after D.Pedro V death. It was up to D.Luis to negotiate with his step-mother the countess of Edla. Anyway, always worth a visit. D.Fernando did NOT buy the palace of Pena. He DID BUY the original building and restored it (that's what I said anyway). I must have miresad you , or not . Anyway, let's not fight about it. One thing interesting about D.Fernando II. According to Portuguese law, the husband of a queen regnant could be titled King only after the birth of a child from that marriage. After the birth of the Prince Royal (the future Pedro V), Queen Maria II's husband was proclaimed as King Ferdinand II. How could Ferdinand II be a reigning King if he was only the King Consort? He wasn't a king consort, he was a king jure uxoris - or in right if his wife. Essentially, after the birth of a heir a Queen's consort becomes her co-ruler (at least in Portugal). King consorts often held more power than Queen consorts and would sometimes basically co-rule. It's part of the reason why many monarchies don't use the title "king consort." Ish, Thank you for the explanation of king jure uxoris. I had not heard of this regal title before. I'm not sure if I'd say it was a title - jure uxoris is just the Latin term to refer to a man who rules in right of his wife (which is what it means). His title was king, he got it through jure uxoris. The deputation of constitutionalists before Queen Maria II in 1837.